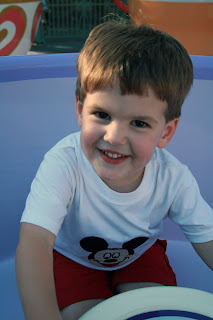 At 12:26pm today, my baby boy turns THREE! How is it possible that he's already three and how is it possible I didn't know him until three years ago? He is such a wonderful and integral part of my life! 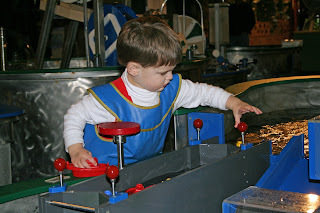 He is an explorer and likes discovering how things function. He's also stubborn, just like his mama, and knows EXACTLY how *he* wants things to work. 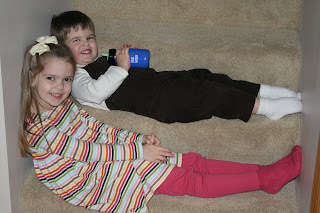 And, of course, he adores his big sister! Absolutely adores her and they are the best of friends. Happy birthday, baby boy!! I love you so much. May God bless you and keep you all the days of your life. 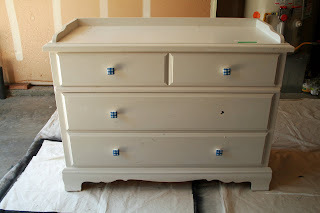 Way back in July, I posted about a dresser I found at a garage sale. I paid $13 for this little beauty--a wood Bassett dresser. 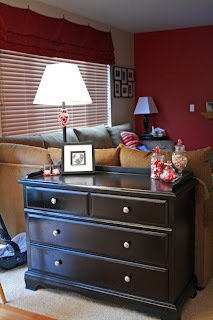 It was love at first sight, even if the dresser did need a bit of work! 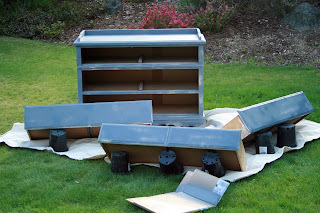 Then in early September I posted about sanding and painting the dresser. And then subsequently needing to repaint the fronts of the drawers after Handsome decided to "paint" with a comb and scratched them up. Excuse the glare--the light was coming in from the sliding door on the left side of the picture and I don't have wood blinds there (yet--it's a gradual process!) to close. Still, doesn't it look pretty?! $13!! Right now it is decorated for Valentine's Day--I'll post pictures of my Valentine decorations in the next week or so. 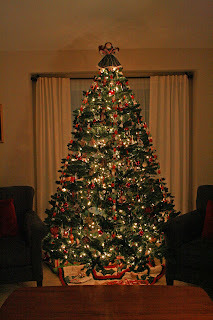 If you're coming over from a link, click HERE to see my other decorating posts. And, of course, please comment and let me know you stopped by! 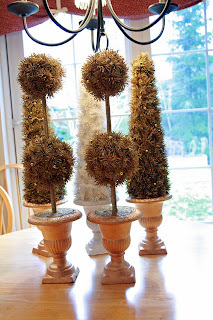 Remember those glittery, tacky, CHEAP topiaries I bought at TJ Maxx a couple of weeks ago? Well, they have been transformed! 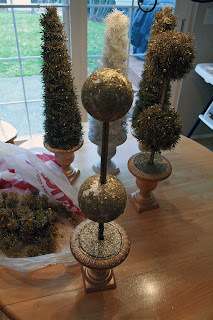 They started out as $4 Christmas clearance topiaries...full of glitter and poky bits. 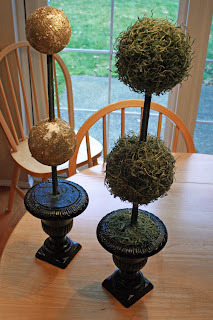 A bit of black spray paint, loads of hot glue, and 1.5 bags of spanish moss...and they're done! I think I like them (both now are done, although they weren't in these pictures)...but my husband just kind of nodded and smiled when I asked if he liked them. So, what do you think? Honest opinions, please! I'm trying to decide if they're good enough to go on the fireplace mantel when I redo it, or do they need to be put up on an armoire where they're not quite at eye level. We were back at Children's Hospital yesterday for an appointment with our GI specialist. This time we did a lot of talking (two hours worth) and now we have a firm handle on what our plan is to help Handsome. Still no answers, but at least we have a plan. First I will meet with a pediatric otolaryngologist (a really specialized ENT doctor) to discuss the scoping of Handsome's airway to check for structural abnormalities. We don't think this is a problem, but we need to cover this base just in case. Next we will be scheduled at the hospital for all the testing to take place at once under anesthesia. He will be scoped (a camera) by the otolaryngologist. Then a GI surgeon will do an endoscopy (a different kind of camera) down his esophagus and into his tummy--checking for inflammation, thickening, and other abnormalities. The GI surgeon also will take some biopsies (teeny tiny ones--as small as a pinhead) of Handsome's tummy. He'll also place a pH probe down Handsome's nose and into his esophagus. Handsome will wear this probe for 24 hours (and be attached to a small portable computer) while it records his reflux incidents. Typically the probe is placed fairly far down the esophagus, but with Handsome it will be put much higher up because with him the really big concern is how often the reflux is coming up to the point where he can aspirate it into his lungs. Finally he'll have a 40 minute MRI without contrast done of his brain. This will be done to (hopefully!) rule out the possibility of Chiari Malformation. After all of this (which will be about 3 hours under anesthesia), Handsome and I will stay in the hospital for 24 hours while the pH probe is taking place. Mainly we'll be there in case he pulls the probe out--other than that, there really isn't a medical reason for us to be in the hospital. All of this should be completed in the next four weeks, hopefully less. They're moving him up the MRI list quite a bit because of the possibility of Chiari. Getting all of this testing done will, we hope, give us a direction to go in with Handsome's treatment. There are a lot of possibilities for what is going on with him. 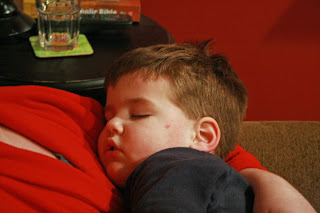 Chiari (especially in light of his swallowing problems) is a possibility. It's also possible that he has a severe allergy to something he's eating and his body is trying to get rid of it--we'll be able to tell that via the biopsies and by the endoscopy. Another possibility is fundoplication surgery. This is when part of the upper part of the stomach is wrapped around the lower part of the esophagus--it tightens up the end of the esophagus so that food can still get through, but reflux can't come up. So, there is a LOT going on here. Even though I don't have answers yet, I do like having a plan in place. Who wants a super hero cape? Are these not the cutest superhero capes EVER?! Oh I just love them!! Unfortunately they usually cost $30 each...which is a bit out of my budget, especially since I would need two of them. 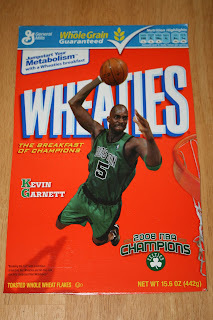 However, there is a super giveaway going on and you get TWO of these if you win!! So neat! 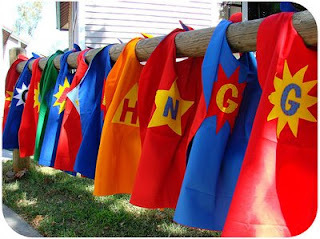 So go over to Little Window Shoppe for your chance to win TWO superhero capes from Plum Pear Apple. I am so ready for spring and warm weather! However, since I can't control the weather, I decided at least I could get started on spring cleaning. This way when spring finally does arrive, I'll be ready to enjoy the weather (or, more likely, devote my time to cleaning up the yard...ugh!) --plus I like having things neat and organized. Ugh, what a mess! This is the upper cupboard to the right of my stove. It is one of those really awkward cupboards where the shelf extends about a foot past the door...and I had it crammed full of stuff! There was a method to my cramming, but it was pretty messy and definitely needed to be organized! Every single thing on my stovetop came out of that one cupboard. Pretend not to notice how much stuff is piled up...because it is a LOT. 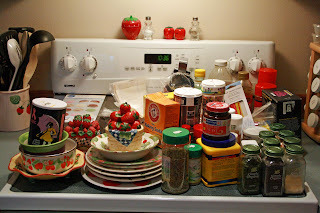 Candy molds, decorative strawberry dishes (I collect strawberry kitchen stuff), spare spices, lots and lots of cupcake sprinkles, molasses (multiple types! ), the list goes on and on! Ahhh, a clean and empty cupboard! Ignore the oak cabinetry that I really don't like at all...that's on the "will be changed a future date" list. So much better! And look, I found more space! Woohoo! 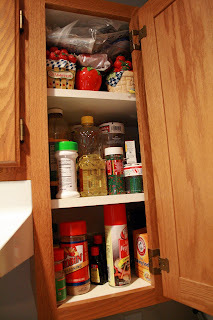 That space isn't empty any more...I bought a basket at the Dollar Tree and moved my children's extra prescription medicine up there so now it isn't tucked all in amongst my dishes in a different cupboard. My little ones take a lot of medicine and we order most things from the mail order pharmacy that ships three months of meds at a time...so the medicine situation was getting out of hand. 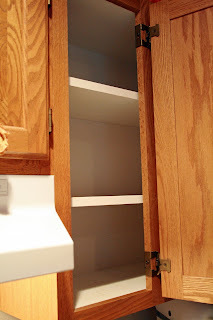 I'll spare you the pictures of the rest of my cupboards (especially since I'm not done yet!) 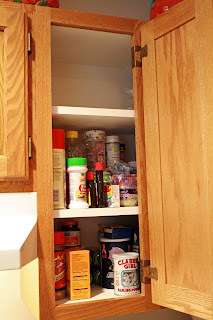 but I must say, I feel such a sense of accomplishment when I open up the cupboards that are freshly purged and organized. At least I can have control over one area in my life! Have you started your spring cleaning? Are you (like me!) someone who likes to purge and organize or are you (like my husband!) someone who wants to keep everything forever and ever? Why oh why can't there be easy answers about what is going on with Handsome? After spending all afternoon at Children's Hospital, I came home more confused than ever. He had another swallowing study done (a x-ray camera filmed video as he consumed barium laced products) and it showed that he still aspirates fluid every time he drinks. And, when he's eating, he sometimes doesn't realize he has food in the back of his mouth and thus doesn't swallow it. This likely is what is happening when he eats meat at home and probably is why he doesn't like it. Their theory is that, as a coping mechanism, his body has desensitized the back of his mouth/throat so that he doesn't feel as much pain from his reflux--but unfortunately this also means he can't swallow properly. 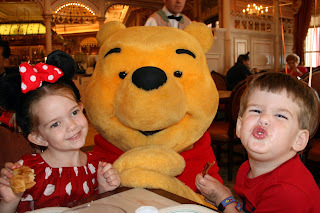 They think that getting the reflux under control (we've been working on this for two years!) will help as will a bit of feeding therapy. Unfortunately there is another theory on Handsome's swallowing problems. 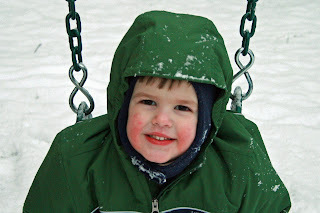 The pulmonologists think there is a chance he has Chiari Malformation. Basically their theory is that it is possible that part of his brain stem is pushing down into his spine and compressing the nerves there that control swallowing. So they want him to see a neurologist and go under sedation for a 40 minute MRI. While he's under anesthesia, they also want an ENT doctor to scope his nasal passages and make sure everything is connected properly. The treatment for Chiari Malformation is a brain surgery, referred to as decompression surgery, where neurosurgeouns remove a really small portion of the patient's skull to provide more room for the brain. After spending hours researching Chiari Malformation last night, I really really do NOT think this is Handsome's problem. There are two main types of this disease (and two others that are really rare and don't apply to him at all) and the first type is seen more in older children and adults--and most of those people experience blinding headaches that appear out of nowhere. The second type is seen almost entirely in children with spina bifida or hydrocephalus...and Handsome has neither of those. Still, I can't entirely discount this...but I'm reluctant to put him through an MRI that I'm not entirely convinced he needs. I was convinced in the hospital yesterday, but now I'm not so sure. We go back on Friday, but we'll be seeing the GI specialist this time. Needless to say, my mind is spinning. Today I am returning to Children's Hospital with Handsome for more testing. 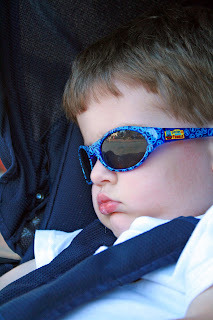 He turns three at the end of this month and still deals with increasingly worse reflux and, at our last visit to the hospital, was diagnosed with oral pharyngeal dysphagia. Basically every time he swallows liquid, he aspirates part of it into his lungs...and, given that he has reflux, he also is aspirating stomach acid into his lungs. Needless to say, this is not good! 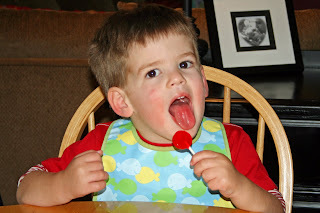 It is especially bad because he's pretty much at the end of the window of opportunity for outgrowing these things--and dysphagia (he has two types) in a child his age is quite worrying. I'm not sure what is in his future, but I'm worried. Currently all we're doing is thickening all his liquids (which he seems to appreciate--not the reaction I was expecting from him!) and giving him inhaled steroids to strengthen his lungs. Future options include occupational therapy for his mouth, brain scans, and some very very invasive tests. We'll know more after his repeat fluroscopy and appointment with his pulmonologists. 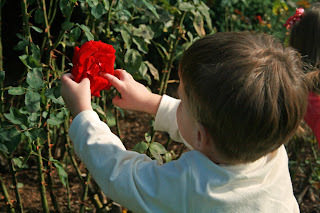 We go back to Children's again on Friday to meet with our GI specialist and talk more about our options for addressing his reflux--which is worsening again. He's now on 30mg of Prevacid in the morning, 4 ml of Zantac and 15mg of Prevacid at night. Even at these increased dosages, he wakes up all night long and his sheets are covered with stomach acid in the morning. Poor little guy. He does a bit better with it during the day, but it still bothers him--and he is soooo tired from his poor sleeping. Edit: On a different note, today my make-your-own puzzle post is being featured on No Time for Flashcards! Yesterday I went into Michaels and, of course, I bought WAY more than I went in there for--why does that always happen? 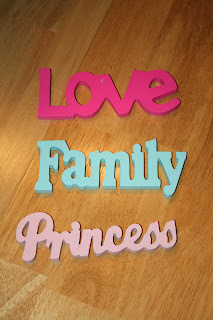 I did find these three little signs on clearance for .49 each. There were others that weren't clearanced and they were a whopping $1 each...so still not too expensive. The only problem is that the colors were all wrong! The "love" sign was a BRIGHT and gaudy pink. Pink is one of my favorite colors, but not this particular shade of pink! So, while my husband gave the children a bath, I quickly painted my little signs and hot glued ribbon onto the back of two of them. 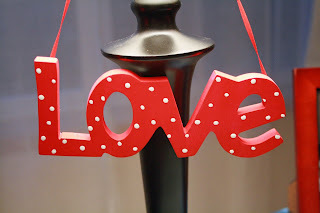 The "love" sign I painted red with white polka dots and glued a red ribbon onto. 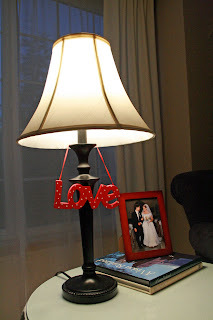 Right now it is hanging on a lamp, but I'm not sure where its home will be--but it is a great little Valentine decoration and the price was right! The "family" sign I'm not quite done with. I did paint it another shade of blue, but I don't like it yet...so no new pictures of that one! 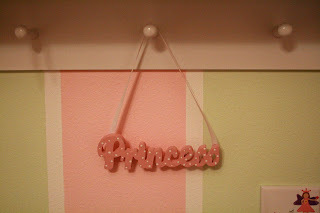 I decided the pink color of the princess sign would work for Princess's room, but it needed white polka dots too--and a ribbon to hang it on. Right now I have it hanging from a small shelf in her room, but eventually I'd like to hang it from a rag garland that I still need to make. I think it will look cute tucked in amongst the rags. It really is so easy with these instructions in front of you! 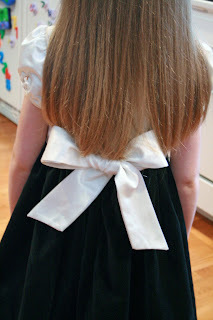 Oh wait, let me get her hair out of the way--can you believe how long it is?! 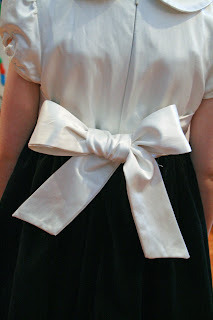 Granted, the sash ties a bit above her waist, but still...her hair is getting loooong! Okay, I probably should have redone it to get the ends the same length, but I didn't. 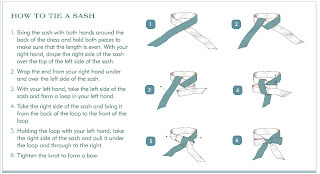 And, I'm happy to say, the sash is very secure with this method. It didn't come undone at all! Look!! Super duper tacky glittery topiaries!!! What? They don't look so bad to you? You don't see the sparkle? Just wait...I used the flash on a closeup, just for you! Now do you believe me? They're so shiny and poky and, um, well, not exactly what I was looking for...but the price was right! They were in the Christmas clearance section. 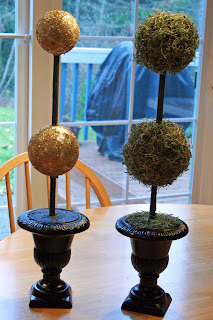 The ball topiaries were $5 each and the cone topiaries were $4 each. Perfection! You see, I want to redo my fireplace wall and I've been looking for affordable topiaries and haven't had much (any?) luck. Topiaries are EXPENSIVE! So these, despite their tackiness, are great! Like the glitter on my table? 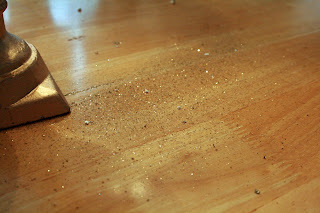 This is just SOME of the glitter that now is all.over.my.entire.kitchen after pulling the poky glittery things off ONE (just ONE!) 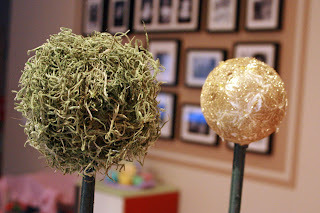 of the ball topiaries. 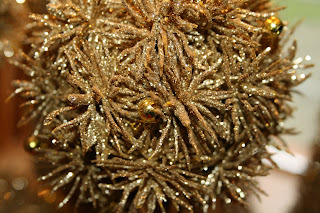 The topiary is looking better already even though it's still pretty glittery. Are you starting to see my vision? I'm thinking of painting the gold urn black, painting the gold glittery stick brown, and then hotgluing moss on the styrofoam balls and on top of the glittery mess that is inside the urn. What do you think? Is there a better way to do this? Oh wait, will hot glue melt styrofoam? Hmmm...maybe I better test this out first! Give me your thoughts, please! Oh and the cone shaped topiaries? I'm going to save those for Christmas and replace all the poky stuff with small colored balls. They'll be soooo pretty! Isn't it fun to see what you can find in amongst all the stuff at a place like TJ Maxx? Once I started thinking outside the box, it was amazing what I found! Allie at No Time for Flash Cards (which is a fantabulous blog for those of us with little ones) has a great Melissa and Doug Giveaway going on! Woohoo!! I love Melissa and Doug toys and we have them all over our house. 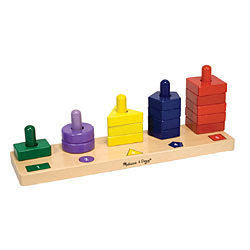 So, if you'd like a chance to win this stacking and sorting toy, head on over here. Feel free to leave me a comment first, though! I hope everyone knows about Etsy because I *love* that site! I go in spurts with purchasing from Etsy, but overall have been so much happier with my Etsy purchases than my eBay purchases. Anyhow, everything on Etsy is handmade (not factory made) and is new--or something new that is made out of repurposed older stuff. There is some NEAT stuff on there! 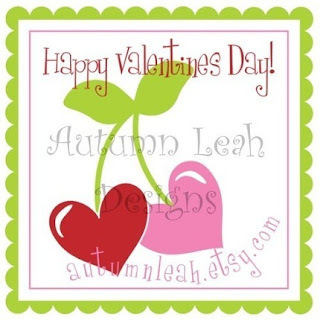 Earlier this week I purchased some adorable personalized stickers from Autumn Leah Designs. I found her Etsy shop when I was blog hopping--I think I stumbled on her sister's site...and of course now I can't remember what the blog was called. Ooops! Anyhow, I ordered these stickers and we'll use them on Princess's Valentine favors at preschool. They're going to be sooo cute! Today at preschool we encountered yet another classmate with a missing tooth. I will *cry* when Princess loses her first tooth. Actually, I'll sob. I already cried when the dentist showed me the x-ray that showed her permanent teeth starting to move up through her jaw. At any rate, this teeny tiny (smaller than my almost three year old!) 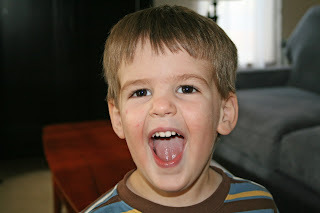 five year old showed me the gap in her mouth and informed me that the "toof faiwy" brought her "four tworters" (so funny--I think she's lisping because of the gap). It made me realize I need to get on the ball! So tonight I ordered two tooth fairy pillows from Lil Pink Chicken on Etsy. I ordered two because *of course* I need to have nearly identical ones for the two children, so I'm planning ahead. 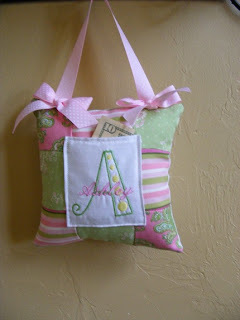 The pillows are so cute and the price is fantastic--just $9.99!! The cost of the materials plus the cost of gas to get the materials plus the cost of my frustration with my sewing machine...well, let's just say it would be a LOT more than that if I were to make these myself! Isn't the sample pillow cute? 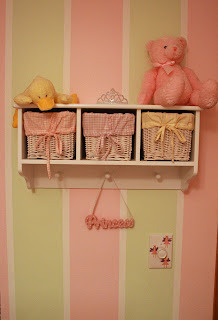 Love it--and it is the colors of Princess's room. I ordered Handsome one that is blues and yellows. The pillows are perfect because they can hang them on the outside of their doorknob and the tooth fairy won't accidentally wake them up. My friend Jill makes the CUTEST bling tees for girls of all ages...if you squint really hard (or just click on the picture!) 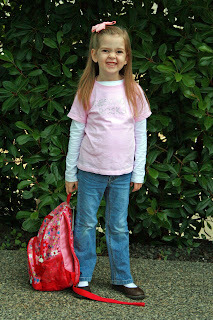 of Princess, you'll see that she's wearing a "Preschool Rocks" bling tee. She LOVES it and always gets so many compliments on it. My friend Jill's store is called Twinkling Tees and she is having a fantastic sale right now that will get you 25% off your purchase if you enter the code NBD at checkout! Her shirts are so cute--I just ordered three more! One for Valentine's Day, one for Christmas next year (hey, I plan ahead! ), and a cute "big sister" tee for my little niece who soon will be a new big sis! Aaaaaannnndddd...I know of a website that is doing a giveaway of a gift certificate to Twinkling Tees! Woohoo, everyone loves a giveaway! 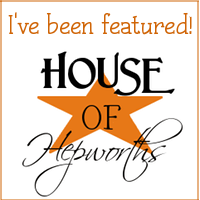 Head on over to Mom's Most Wanted to try to win a freebie from Jill! Edit: If you're visiting from No Time for Flashcards, welcome! I'm happy you're here and I hope you'll come visit the rest of my blog! Please let me know that you visited! I have a little boy who adores puzzles. His sister likes puzzles, but he LOVES them. He would do puzzles all day if I let him. Unfortunately my budget cannot keep up with his appetite for puzzles--and we have a LOT of puzzles! Sooo, I decided to make him some puzzles and he loves them!! I took a bunch of food boxes, cut the fronts off and then cut those into pieces...voila! Instant puzzles! These puzzles don't have a lot of pieces (although the Costco size box of Cheerios does have a bunch!) 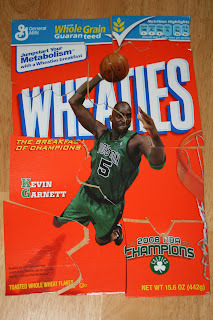 but they provide a challenge to him because the pieces don't "lock" together as nicely as store-bought puzzles. At any rate, my children enjoy them and find it highly amusing to do the "waffle" puzzle and the "cracker" puzzle. 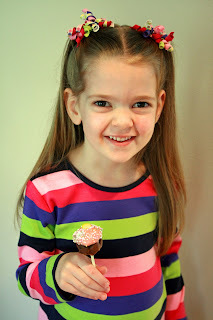 If you are looking for an adorable treat for a birthday or a baby shower, you *must* try Bakerella's Cupcake Pops! 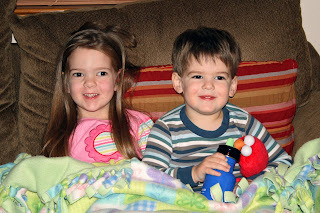 They are so cute and so easy to make--but they are very time consuming to construct. My children and husband loved eating them and they received rave reviews from the children and teachers at my daughter's preschool. I found them too sweet (which shocked me! ), but they're so adorable, I know I'll be making them again! I made them for my little girl to bring to preschool for snack on her birthday--she brought these (which are MUCH smaller than a regular cupcake) along with banana halves and everyone was happy. There weren't any leftovers, that's for sure! Basically you bake a sheet cake, grind it up in the food processor, combine it with frosting and make little cake balls. After you refrigerate the balls for a bit, you press one end of each ball into a cookie cutter to make the bottom fluted like a cupcake. 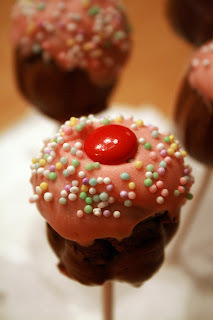 Then there is more refrigeration before you dip the bottom of each little cupcake into chocolate and insert a stick. 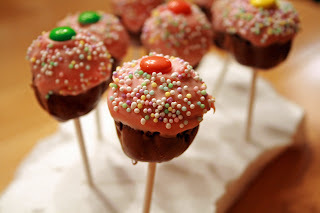 They you dip the top of each cupcake into a colored candy melt, put on some sprinkles, and top with an M&M. 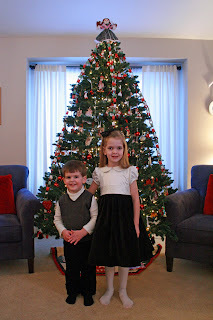 They are so cute and Bakerella has fantastic instructions on her blog. These even were featured on the Martha Stewart Show! 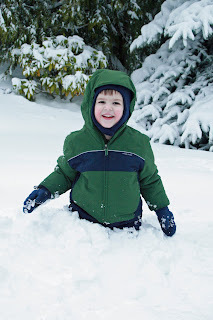 Well we were swamped with snow before Christmas and our area does NOT do snow well! I think UPS still is delivering the backlog of packages--they had two weeks worth of packages at their distribution centers because their trucks couldn't get through the snow! It was *crazy* around here! So, I was stuck in my house for the week before Christmas because of the weather...and then the week after Christmas I was stuck in my bed because of some horrible ailment that combines the aches of the flu with a long lasting migraine. It was NOT fun! Luckily I did my shopping online and I did it EARLY--not as early as past years when I was done with shopping by Thanksgiving, but I did still do it early enough that I didn't have to worry about Santa's gifts being held hostage by UPS! One of my favorite places to order books from is Barnes and Noble--and if you go through BoxTops4Education, not only do you still get the standard free shipping if your order is over $25, but your favorite school will earn back 6% of your purchase! 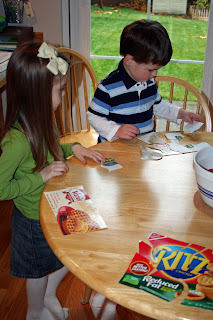 It is WAY easier to earn money for your school this way rather than clipping all those boxtops...although I must admit, I do still have piles of boxtops around too. So, go shopping! Spend those Christmas gift cards!! And, by the way, if you have a little girl, I have a book recommendation for you. We checked this book out from the library and my little girl cried her eyes out when she realized it was a library book and not one that we could keep--usually she's very good at returning books, but she really fell in love with this one. Lucky for us, it is in stock online at Barnes and Noble! It is such a sweet book about a little girl and her daddy. It would be a perfect Father's Day gift or just a special daddy-daughter book. The illustrations are charming, too. Just a great book all around!